Despite being based on a book by homophobic writer Orson Scott Card (the same Card of the “Adventures of Superman” controversy earlier this year), the public either didn’t know or care, as “Ender’s Game” topped the box office this weekend with $28 million. Meanwhile, “Free Birds,” the new movie about time-traveling turkeys who go back to the first Thanksgiving to prevent turkeys from ever being on the menu, debuted in fourth place with $16 million, behind “Bad Grandpa” and Morgan Freeman’s “Last Vegas” in #2 and #3 respectively. While the studio seems to be relying on the lead-up to Thanksgiving for success with “Birds,” I wonder if “Thor 2″ next weekend” will lessen its chances. 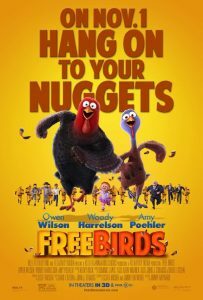 Reviews for the film by critics are lackluster; “Birds” has a 21% freshness rating on Rotten Tomatoes, while some on Twitter have labeled it as a knock-off of “Chicken Run.” While it cost only $55 million to make, I’d imagine most of its success will come from domestic box office, as Thanksgiving isn’t celebrated outside of North America. I’m not sure how much the rest of the world will care about a movie about turkeys altering a holiday nobody but us celebrates. To get around this, Cartoon Brew reports that the foreign release of “Free Birds” will rename the holiday to “The Big Feast”…despite the heavily/clearly Thanksgiving-centric theme. Uh-huh. “Gravity” fell to fifth place with $13 million, while “Cloudy With a Chance of Meatballs 2” is in eighth place with $4.2 million. A full list of rankings is available at Box Office Mojo. Internationally, “Thor: The Dark World” (aka “Thor 2”) is raking it in overseas, as it’s opened ahead of the US. So far, it’s made $109.4 million since opening Wednesday. I fully expect it to decimate “Ender’s Game” (and possibly “Free Birds,” among other box office fare) when it opens this Friday, making “Ender’s” hopes lie with foreign box office take (since otherwise it’s a flop, having cost $110 million to make).